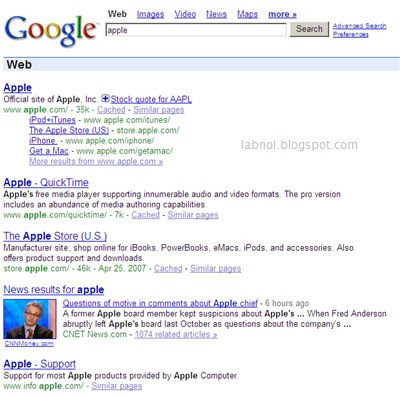 Google is experimenting with image thumbnails in organic search results (see screenshot) - Try a Google search for terms like Apple, BlackBerry or Vladimir Putin and you may experience the new Google results layout first hand. 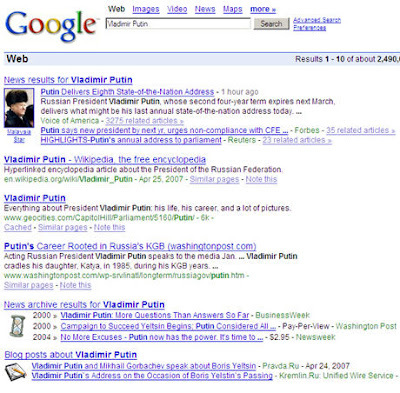 In case of Vladimir Putin, Google added results from Google News, Google News Archives and Google Blog Search - all on the main Google search page. Currently, the website thumbnails are displayed only for the Google News results placed after the top three organic search results. Hope it's just a temporary experiment else it may bring some bad news for regular web sites that are also displayed in the organic results - thumbnails will help draw the attention of search engine users and may alter the traffic on regular websites that are display in Google Search results sans the thumbnail. Why Do You Think The Internet Was Born ?